Why Are Energy Prices Still Rising in New England? High natural gas prices in the Northeast are not new or unexpected. Algonquin City Gate prices into Boston and Transco Zone 6 New York prices are consistently among the highest in the U.S. market. In 2014, 2 Bcf/d of new capacity was added to the Northeast, but most of it was not destined to help New England. Last year’s polar vortex breakdowns that blasted the Northeast in arctic temperatures exposed New England’s extreme vulnerability as natural gas spot prices climbed as high as $78/MMBtu. 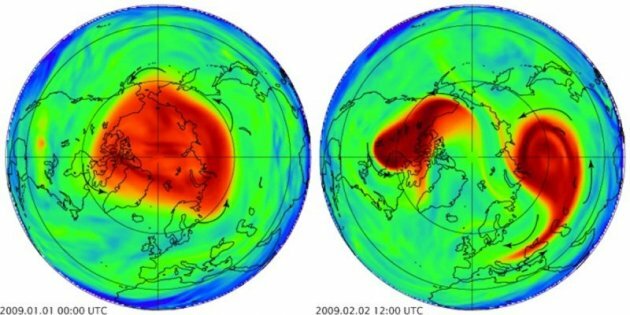 A graphical display of what happens during a polar vortex breakdown is shown below, with a normal vortex on the left and one that has broken down on the right. As the Northeast struggled to cope with the unexpectedly frigid weather from the two polar vortices that struck last winter, New England’s natural gas and electricity prices soared. The underlying problem for the New England market is fairly basic: inadequate pipeline capacity. However, the problem is compounded because it leads to price spikes during peak demand for both natural gas customers and electric generators who are increasingly depending on natural gas to fuel their power plants. Due to geological constraints, there is no locally available gas storage that would help smooth out peak demand. New England imports LNG, however, competition for LNG is global so it is often more expensive than U.S. natural gas. While imported LNG can help ease peak demand shortages, it cannot reduce overall energy costs. The solution to this myriad of issues is complicated and involves spending money to expand the current pipeline infrastructure. 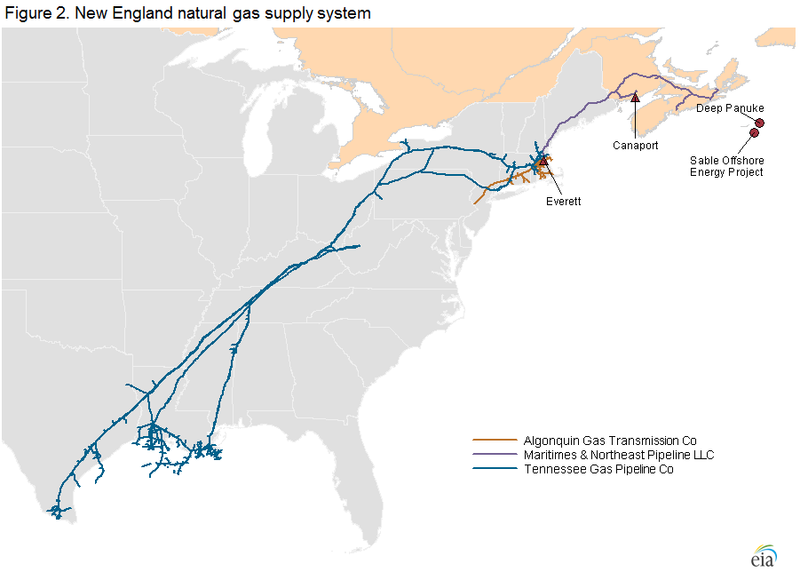 Algonquin Gas Transmission and Tennessee Gas Pipeline, the largest suppliers of natural gas to the region, have already announced plans to increase pipeline capacity by 4.1 Bcf/d by the end of 2018. Pressure from the demand side will continue as New England must either replace 3,400 MW of coal, oil, and nuclear generation that will be retired by the end of 2018 or find some way to reduce its demand by that amount. Natural gas-fired generation has grown in the meantime as New England replaced some of its older, fossil-fuel plants with cleaner-burning natural gas-fired plants. The graph below from ISO NE shows the rapid growth of natural gas-fired generation from 2000 to 2013 and its forecasted growth by 2020. The growth of natural gas-fired generation in New England only puts more pressure on the constrained gas infrastructure. When spot natural gas market prices spike, it means generators also pay more for their gas, and then end-use customers pay more for their electricity. Thus, we have circled back to the problem as outlined by the new governor: Consumers in New England are paying more for energy than those in other parts of the country. The solution to build more pipeline infrastructure may not be particularly edgy, complex, or technologically exciting, but it will lead to a solution. Text of Charlie Baker’s Inauguration Speech, January 8, 2015, The Boston Globe. Algonquin City Gate (Boston) natural gas spot price on January 23, 2014, SNL. Polar Vortex Review: Natural Gas Perspectives, Adams, Briana and ICF International, 2014. What is the ‘Polar Vortex’ Sweeping Across the U.S., and How Did it Form? The Journal.ie, January 4, 2014. Natural Gas Weekly Update, January 28, 2015, U.S. Energy Information Administration. Today in Energy: December Natural Gas Prices Spike in Boston, December 3, 2013. Today in Energy: New England Sport Natural Gas Prices Hit Record Levels This Winter, February 21, 2014. Today in Energy: Boston, New York City Winter Natural Gas Prices Expected to Remain High, November 24, 2014. Today in Energy: New England Generation Fuel Mix Changes Likely as Vermont Yankee Nuclear Plant Retires, February 2, 2015. This entry was posted in Natural Gas and tagged Natural Gas Markets, Natural Gas Pipelines, Natural Gas Prices, Natural Gas Supply and Demand. Bookmark the permalink. 1 Response to Why Are Energy Prices Still Rising in New England?